Fed by especially strong demand in North America, Nike posted stronger-than-expected results for its fiscal third quarter, and increased spending on digital brand marketing and sports marketing. The Beaverton, Ore.-based company says revenues for Nike Inc. climbed 7% for the period to $7.5 billion, a 13% jump on a currency-neutral basis. At the Nike brand itself, revenues climbed 11% to $6.9 billion. And at Converse, sales soared 33% to $538 million. Net income grew by 16%, reaching $791 million. Total spending on demand creation was flat at $731 million, with ad expenses declining a bit due to the timing of product launches. Future orders for Nike brand athletic shoes and apparel are just 2% higher worldwide. Excluding currency fluctuations, those orders are 11% higher than in the same period a year ago. “Our strong third-quarter results show that our growth strategies are working, even under challenging macroeconomic conditions,” says CEO Mark Parker in its announcement. In North America, sales gained 6% in the quarter, with basketball and sportswear products selling especially well. (In its retail stores, same-store sales advanced 7%.) Core running footwear, which Poser believes is largely the Nike Free, is not performing well. The company forecasts revenue gains in the mid-single digits for the next quarter, as well as mid-single digits for the full fiscal year. 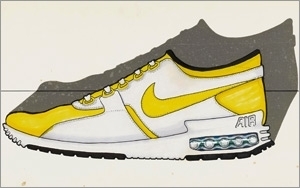 Separately, as part of the introduction of Air Max Zero, the company has released archival background on the Air Max design pedigree, billing the shoe as “the One before the 1.” Elements of new shoe, based on designer Tinker Hatfield’s first vision of visible Air cushioning back in 1985, have been “tucked away from everyone’s eyes for nearly three decades,” the company says, and that new shoe “blends heritage with technological advances for its modern day arrival.” See the videos here and here. 1 comment about "Nike Posts Strong Quarter; Ups Digital Ad Spending". chi liang from ASU, March 23, 2015 at 5:16 a.m. The new ad for the Nike Air Max is pretty simple and easy to know what's about the product, i knew it is Air Max before i finish watching the ad, it's only 21 seconds of this ad, really creative using colorful bubbles to show how light the shoes are and also tells there are many colors to choose from. Successful ad should be short and impressive also easy to understand.